Announced through Adobe's official blog, Illustrator CC takes a cue from users by incorporating a number of highly requested features like straightforward image cropping, a function previously accomplished by offloading documents to other apps. With Image Crop, Illustrator CC users now have the ability to immediately crop images placed into a document with intuitive crop handles. 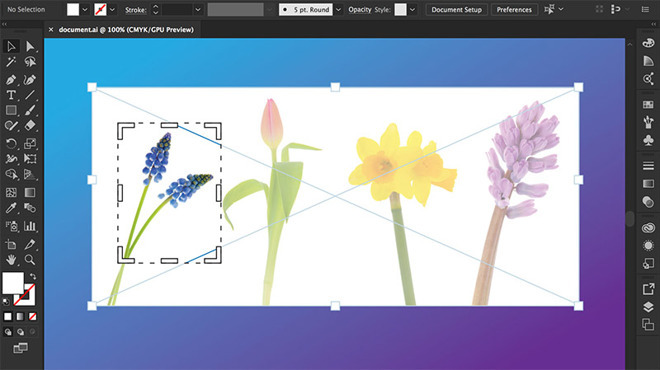 Much like cropping tools offered in other Adobe products, including the flagship Photoshop CC, Image Crop in Illustrator CC comes with measurement tools and a familiar dotted bounding line. In addition to inline image edits, Image Crop automatically discards unused image data to reduce file sizes and improve overall performance. Aside from the new cropping option, Illustrator CC introduces a Color Themes Panel for creating, exploring and saving color themes for later use. The panel UI also extends to other Adobe apps, offering users consistency across various platforms. For example, themes can be generated from pictures taken with the Adobe Capture mobile app, which are then pushed to Illustrator through Adobe's cloud. As for InDesign CC, the document layout software received a new UI that lets users jump between Adobe apps and flagship cloud features. A redesigned New Document Panel is included for quickly starting new projects with document presets and recent document settings. Further embedding Adobe CC elements into the main app is integration with templates from Adobe Stock, which can be accessed via the New Document Panel. Adobe's Creative Cloud plans start at $19.99 per month for single apps like Illustrator CC, while access to all CC apps comes in at $49.99 per month.